§ 11. 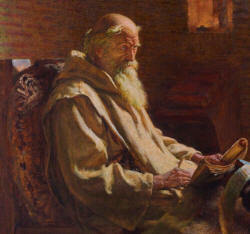 His faithful messenger, the abbot, having told this to the king, both Guthred himself, and the powerful King Alfred, of whom we have made mention above, proclaimed it to their subjects, and established it as a law for ever, with the consent and approbation not only of the English, but also of the Danish army. They ordained that those who in any manner whatever broke the saint’s peace, should pay, as a fine, a sum of money equal to that which they paid for breaking the peace of the king, namely, ninety-six pounds at least. Moreover, the land, lying between the two rivers above-mentioned, was afterwards given to him as he commanded, and a decree was passed, with the concurrence both of the kings above-named and of the whole people, that if any one should give land to St. Cuthbert, or if land should have been bought with the saint’s money, no one, from that time, should claim from it any service or custom whatever, but the church alone should possess it for ever in peace, with all its liberties and customs, and, as the saying is, with sac and socn, and infangentheof. It was determined by all, that, if any one should in any way infringe these laws and statutes, they should be consigned for ever, unless they behaved better for the future, to fire in hell and the malediction of the church. A short time after, the Scots assembled a large army, and, among other deeds of cruelty, attacked and plundered the monastery of Lindisfarne; and whilst King Guthred, strengthened by the help of St. Cuthbert, was fighting against them, on a sudden the earth yawned and swallowed up all the enemy alive. Thus was re-enacted a miracle of ancient times, whereby the earth opened and swallowed up Dathan, and overwhelmed the congregation of Abiron. But how this was done has been described elsewhere. § 12. In the year of our Lord’s incarnation eight hundred and ninety-four, King Guthred, having reigned many years in prosperity, departed this life, and bequeathed the privileges of the church of St. Cuthbert, concerning its repose and liberties, and the safety of those who should seek refuge therein from all aggressors, with other statutes in its behalf, to be preserved inviolate by all the kings and bishops, and all people who should come after him, and they are so preserved unto this very day. Indeed, no one has ever ventured, with impunity, to infringe them. Of such as have ventured, the Scots, as I have said, having violated its peace, were suddenly swallowed up alive. Others, also, who committed the same crime, were terribly punished for the same, as we shall hereafter describe. When Guthred was dead, King Alfred received the crown of the Northumbrians: for after St. Cuthbert had appeared to him, he added to his paternal kingdom of the East Saxons, the province of the East Angles; and now, after Guthred’s death, that of Northumberland also. § 13. In the year of our Lord’s incarnation eight hundred and ninety-nine, the same pious Alfred, King of the Angles, died after a reign of twenty-eight years and a half, and was succeeded by his son King Edward, who had been diligently warned by his father by all means to love and honour St. Cuthbert and his church, in memory of the difficulties and misfortunes out of which he had rescued his father, and had restored him to his kingdom, which, by the defeat of his enemies, he had enlarged beyond the limits of any of his predecessors. § 14. During the same year in which King Alfred died, Bishop Eardulf, of whom we have frequently made mention, departed this life in a good old age, to receive in heaven the reward of his righteous labours. This was the forty-sixth year of his episcopacy, which was the nineteenth year from that in which the body of St. Cuthbert had been translated to Cuncacester. The episcopal see was after him given by the suffrages of all to Cutheard, a man irreproachable before God and men, for the virtues of his life. His care in providing sustenance for those who served God in the presence of the incorruptible body of the saint, and the number of estates which he bought with the saint’s money, and added to the former donations of the kings, are fully described in the chartulary of the church, which contains the ancient munificence of the kings and other religious individuals towards the saint. Now, whilst Edward was ruling the kingdom of the East Saxons, East Angles and Northumberland, Cutheard also being Bishop of the Bernicians, a certain pagan king, Reingwald by name, appeared with a large fleet on the coast of Northumberland. Immediately York was taken, and all the better part of the inhabitants slain or expelled their country. After this, he seized the whole domain of St. Cuthbert, and distributed his estates to two of his own soldiers, one of whom was called Scula, and the other Onlafbald. The former of these, Scula, having obtained dominion of all the country from the village of Iodene to Billingham, oppressed the wretched nation, by imposing on them a grievous and intolerable tribute. Wherefore, even to this day, the inhabitants of York, as often as they are compelled to pay the king’s tribute, endeavour to relieve themselves by imposing a fine of money on that portion of the land of St. Cuthbert which Scula had possessed. No doubt they make a law of that which a pagan had done from tyranny, and one too who served not a lawful king of England, but a barbarian, and a foreigner, and an enemy to the English king. But although they have taken great pains to introduce this custom, the resistance of St. Cuthbert has always prevented them from accomplishing their object. The other portion of the estates was occupied by Onlafbald, who was still more furious than the other towards his people, and thereby drew destruction on himself. For at length, when he was every way injuring and molesting the bishop, the congregation and the people of St. Cuthbert’s, and pertinaciously usurping to himself the farms which properly belonged to the bishopric, the bishop, wishing to gain him over to the Lord, said to him, “I beseech you, lay aside this obstinacy of mind, and refrain from this unlawful invasion of ecclesiastical property; for, if you despise my admonitions, do not doubt that the Holy Confessor will severely avenge the injuries which you have heaped upon him and his.” The other, at these words, was excited to most diabolical anger, and replied, “Do you talk to me of the threats of this dead man? Do you think he can help you against me? I call my Gods to witness that I will show myself a most bitter enemy to this dead fellow, as well as to you.” Upon this, the bishop and all the brethren fell upon their faces, and prayed to God and the Holy Confessor that his threats might be defeated. The wretch himself had come as far as the entrance, and already had placed one foot within, and one without the threshold, when of a sudden both his feet were held fast, as if by nails, to the ground, and could neither come in nor go out, but remained immoveable where he was. Here he remained some time in anguish, until he confessed aloud the sanctity of the Holy Confessor, and yielded up his soul the next moment in the place where he was standing. The others were frightened at this warning, and never again presumed to invade the lands or anything else which belonged to the church.